David Krovblit born and raised in Toronto, Canada, studied Photography at Ryerson University. He has merged his career as a professional advertising photographer, shooting national and international brand campaigns, with creating artistically celebrated artworks as a fine art photographer. His Art is influenced by the everyday world, which he interprets depicting an artistic response based on common issues and images that as an Artist he transforms in intriguing and provoking depictions. His powerful images are engaging to viewers, creating relevant personal thoughts and feelings. To contemplate his collage photography is a visual and intellectual experience. Krovblit has a keen eye for detail and great skill with the medium. He plays with symbolic images that in his artwork acquire entirely opposite meanings, from delicate or priceless to volatile and surprising. His beautiful creations play with the ironic and the unexpected, such as how a symbol of life might become something destructive or vice versa. Krovblit’s images are eye-catching and provocative. They highlight the contrast of carrying the weight of human history, joining with contemporary society, merging contents of their back story with present creative depictions. Krovblit’s concepts can be of a serious nature, at the same time as his collage combinations create a lightheartedness that makes each piece engaging and approachable, as they talk about subjects from different cultures with a unique variety of assembled images and time frames. The Artworks by David Krovblit have been featured throughout Canada and USA in juried group showcases, in solo exhibitions and are part of private Art Collections in Europe, Asia, Canada, and USA. Contemporary Art Projects USA presented David Krovblit at Scope Art Fair 2018 during Art Basel Miami week. This year he will have a solo show in the Art Gallery at MDC West Campus, Doral, FL. 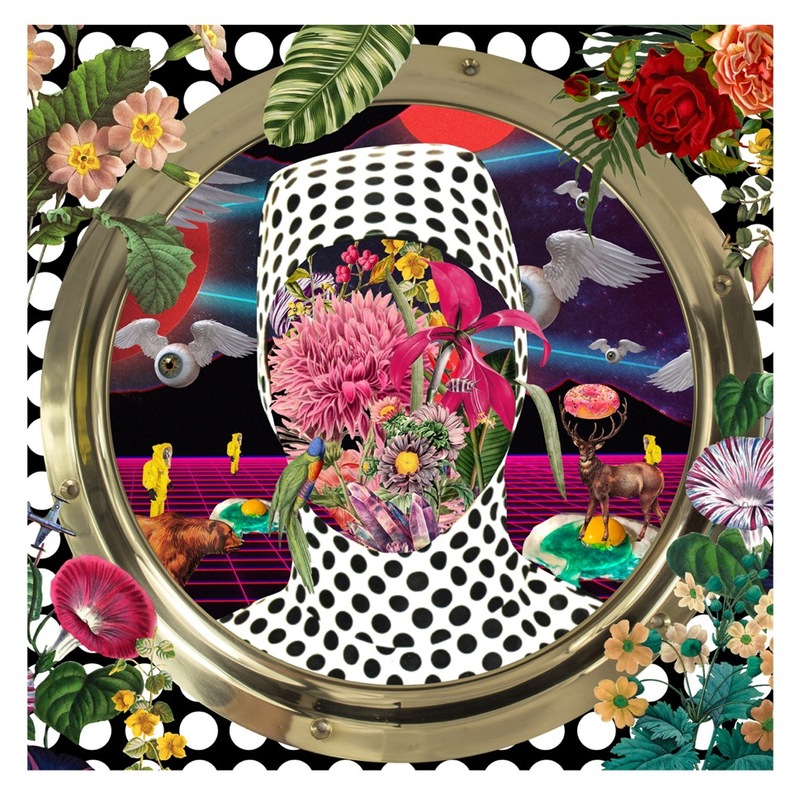 At Art Wynwood 2019 he presents two 48″ x 48″ hand-cut collages of photographs with resin, entitled Deep Dive and Exile. We appreciate his colorful images conceptually rising above contemporary issues, to explore social and ecological themes with great humor and intense messages. Surrounded by beautiful earthly flowers and plants a diver depicted in Deep Dive makes a call to love Nature and don’t dump garbage. In Exile we see a romantic lady astronaut with a doted space-suit warning about a possible need for humanity to have to migrate to other planets, on the Space race to learn about other worlds, on the contamination that men produce in Earth and Space, about the need to protect endangered animal species. Finally, she calls to look out for peace in every sense and to reflect on what we eat or consume, from where it comes and what effect it will provoke in our lives. Both images, one next to the other, will make viewers to experience an immeasurable journey from the deepness of the seas to the infinity of the heavenly space. Looking to one Artwork visitors will feel like staring out from a submarine round window that in the next Artwork transforms in a spaceship window. The overall will make us think that no matter the shape or size of the window from which we look, to properly understand and assume life, it all depends by where we are, what we see, and moreover what we want to accomplish, or to be, or believe about.